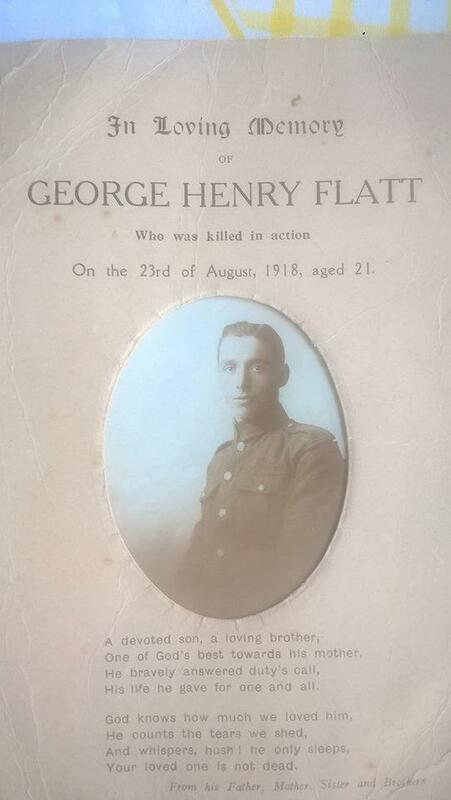 Additional Information: Son of Charles and Sarah Flatt, of 136, Hythe Hill, Colchester. The following came from Colchester historian Joan Soole in October 2011 concerning brothers killed in action. You may have seen the article in the Standard two weeks ago entitled "Brothers in Arms". It was about some of the brothers who were KIA in WW1, ie the two Brunwin-Hales sons of the Rector of St Mary's Church, now the Arts Centre. The article also asked for any info on the three Thomas brothers of Nunn's Road who were KIA, together with the Ablitts these wre the only sets of three brothers KIA. I have had a very interesting e mail from a Marianne Geernaert who is the Widow of a John Geernaert who had three Uncles all killed in the Ist World War. The name is not English, the father of John Geerhaerts' Uncles was a Joseph John Geernaert from Ghent in Belgium who was a member of the British-German Legion who fought in the Crimean War. At the end of the War he stayed in Colchester, married a local girl and had 15 children. The three Uncles, two brothers and one cousin all served with the Canadian Forces and one had also served with the United States Marine Corps - that must a first for Colchester. All their names are on the Roll of Honour and have I e mailed the Canadian Veterans Site at their Embassy in London for further information. Someone in the Geernaert family has compiled a family tree and I am hoping that I can have access to it. I am going to let the ECN have all this information as I think it would make a very good story. As soon as I receive any info from the Veterans Site I'll let you have it.